I think she had the most fun today. Sabeen Mahmud, a fluent speaker of colloquial French in many languages, would have had a field day with words. Starting off with “the bastards never showed up in such large numbers when I was alive”. The second floor was an amazing sight this afternoon. As soon as Zaheer Kidvai posted that Sabeen would come one last time to T2F to say farewell, a crowd started gathering outside. There was no way to describe the mix at 5th Sunset Lane. In attendance were beards and wild hair, lefties and righties, two little girls with small handmade placards, three babies carried by their dads, hundreds of young men and women; guests from Lahore; clean shaved teenagers, sons and daughters; silver grandmothers dressed in white; grayed grandfathers with their walking sticks; founding members of the original men and women student congress that ran the first civil resistance campaign in our country in the fifties and the sixties. Also flowers, tears and silence. Sabeen bound all of us together. That was her magic. We were her lost cause. We parked without getting in each other’s way; we left in a procession of cars aligned in a single file. Civil to a fault on Sabeen’s last day in the neighborhood. When she finally came to Sunset Lane on her way to the Masjid, we walked with her to T2F and back one last time. She was buried in a tree line graveyard by her family, her fans and her friends. We stood still, row upon row of men and women, underneath neem trees with our silent goodbyes and our red eyes. I brought my sixteen year old with me. Told him I want you to remember this day, this crowd standing around, alive yet still; I want you to remember the grief, your father crying in the open in front of a thousand men. Don’t you ever take this for granted. “Ulloo ke pathon kee tarha itnay saal se hum sarkon par nikaltay rahay haen. For every marginalized, oppressed group. And for years, people have mocked us and laughed at us for our small numbers. You doubted our motives. You questioned our agendas. You bastards. If you had joined us, we wouldn’t have been so pitiable. We would have had a movement by now. We would have had strength in numbers. But no, you sat behind the comfort of your monitors and made fun of us on Twitter and Facebook and in your newsrooms. You said, give us something new. Give us something different. Theater karnay thoree nikaltay haen hum aap logon ko khush karnay ke liye. Maana ke Press Club ke baahar kharay honay se kucch naheen badalta laykin jo aek se aek aqlmand haen aap log, jo tanqeed karnay mayn itnay tez haen, yaar aap log kahaan they? Sind Club se fursat ho tau kabhee aa jaen aap log bhee, koee innovative soch le kar jo shaed aap ke Harvard aur Columbia ke professors ne sikhaee ho aap ko. 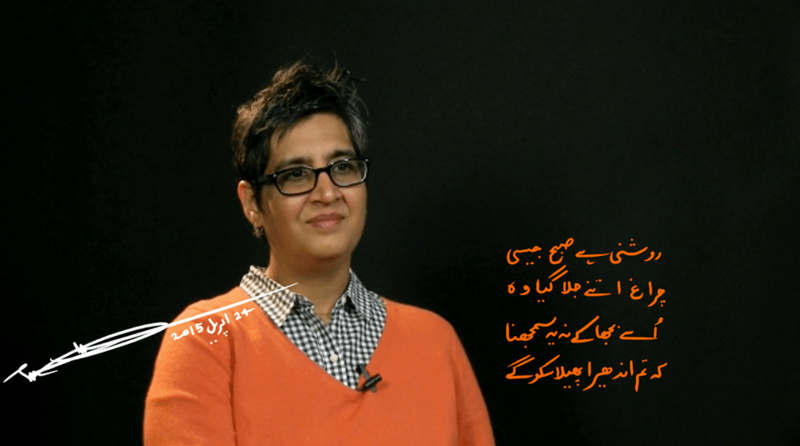 Ya kiya aap ke mummy daddy aap ko nikalnay naheen dayn ge?” Sabeen Mahmud, March 2014.